A samovar (Russian: самовар, Russian pronunciation: [səmɐˈvar]) is a heated metal container traditionally used to boil water in Russia. In its traditional form, a central tube runs up the middle of the container and is filled with burning charcoal, heating the surrounding water. Since the heated water is usually used for making tea, many samovars have an attachment on the tops of their lids to hold and heat a teapot filled with tea concentrate. Though traditionally heated with coal or charcoal, many newer samovars use electricity and heat water in a manner similar to an electric water boiler. Samovars are also found in other countries, particularly Iran, but they are considered icons of Russian tea culture. Providing sufficient water to serve tea to a family or larger gathering of friends, samovars became an essential part of Russian life both in the home as well as in establishments serving tea. They also became a traditional fixture in Russian trains that traveled long distances, such as the Trans-Siberian Railway. Today, samovars are found in museums and antique shops, popular among those interested in Russian culture. A samovar (Russian: самовар, Russian pronunciation: [səmɐˈvar] literally "self-boiler") is a heated metal container traditionally used to heat and boil water in Russia. It is also found in other Central, South-Eastern and Eastern European countries, in Iran, Kashmir and Turkey. A typical samovar consists of a body, base and chimney, cover and steam vent, handles, faucet and key, crown and ring, chimney extension and cap, drip-bowl, and teapots. Samovars come in different body shapes: urn- or krater-shaped, barrel, cylindric, spherical. 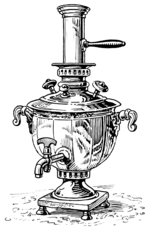 A traditional samovar consists of a large metal container with an ornate faucet near the bottom and a metal pipe running vertically through the middle. Samovars are typically crafted out of copper, brass, bronze, silver, gold, tin, or nickel. The pipe is filled with solid fuel to heat the water in the surrounding container. A small (6 inches (150 mm) to 8 inches (200 mm)) smoke-stack is put on the top to ensure draft. A teapot could be placed on top to be kept heated with the passing hot air. The teapot is used to brew the заварка (zavarka), a strong concentrate of tea. The tea is served by diluting this concentrate with кипяток (kipyatok) (boiled water) from the main container, usually at a ratio of about ten parts water to one part tea concentrate, although tastes vary. The samovar is particularly well-suited to tea-drinking in a communal setting over a protracted period. The Russian expression "to have a sit by samovar" means to have a leisurely talk while drinking tea from samovar. It is somewhat similar to the British custom of tea breaks and sharing a pot of tea. In everyday use the samovar was an economical permanent source of hot water in older times. Various slow-burning items could be used for fuel, such as charcoal or dry pinecones. When not in use, the fire in the samovar pipe remained faintly smoldering. When necessary, it was quickly rekindled with the help of bellows. Although a Russian jackboot сапог (sapog) could be used for this purpose, there were bellows manufactured specifically for use on samovars. The samovar was an important attribute of a Russian household. Sizes and designs varied, from "40-pail" ones of 400 litres (100 U.S. gallons) to 1 liter (1 U.S. quart) size, from cylindrical to spherical, from plain iron to polished brass to gilt. Samovars range from the simple, functional to ornate in style. Accessories such as cups, spoons, and sugar bowls were designed as sets to accompany them. 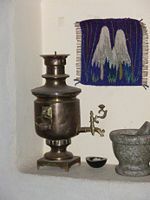 The samovar's precursor was the сбитенник (sbitennik), which was used for heating сбитень (sbiten), a hot winter drink of honey and spice. A sbitennik looked like a metal teakettle fitted with a heater pipe and legs. Eventually samovars replaced them. In the late eighteenth century, a Russian gunsmith, Fedor Lisitsyn, set up a small workshop south of Moscow, in the city of Tula, the heart of the Russian defense industry. Lisitsyn's workshop was the first to produce charcoal-burning samovars industrially and had tremendous success. Shortly afterward, many competing samovar factories started operations nearby. By the 1830s, Tula established itself as the capital of samovar manufacturing. In the nineteenth century, samovars became iconic of Russian tea culture, associated with all levels of Russian society from the palace of the tsars to the humblest of homes it became inseparably bound to the Russian way of life. Classics of Russian literature, like those of authors Pushkin, Gogol, and Chekhov, regularly mention samovars. Chekhov even coined the idiom: "To take one's own samovar to Tula." This phrase is still understood and occasionally used by most Russians, with a meaning similar to "carry coals to Newcastle" in Great Britain. In the second half of the century, samovar manufacturing took root in Moscow, Saint Petersburg, and some industrialized parts of Siberia and the Ural region. However, Tula retained its leading role in this trade. By that time, four shapes of samovars had became traditional: cylindrical, barrel-like, spherical, and the beautiful samovar vaznoy resembling the ancient Greek vase krater. The beginning of the twentieth century was marked by various attempts at innovation. The traditional heating method was challenged by petroleum, kerosene, natural gas, and other means of heating. However, these models proved unpopular, due to the odor of the fuels and the dangers of fire and explosion. Samovar heated with coal in the train on the Trans-Siberian railway. Railroad companies in Russia recognized the practicality and popularity of samovars, and fitted long-distance sleeping cars with them. The Luxury cars of the Trans-Siberian railroad were the first to adopt this custom. Gradually, the samovar in a railroad car was replaced by the boiler of potable water known as титан (titan) in the Soviet Union. Usually the titan was located at the end of the hallway, next to the conductor's closet, for self-service by any passengers who needed hot water during their long journey. Titans had various automatic controls, including temperature and water level (a notable advance over a samovar), a product of the technical revolution that valued practicality over aesthetics. Samovars were retained only in luxury cars under the immediate supervision of the conductor. During World War I and the subsequent turmoil of revolution and civil war, the design and the production technology of samovars were largely simplified and made fit for the military. Roughly welded cylindrical samovars devoid of decoration are characteristic of this period. The late 1920s and early 1930s saw Stalinist collectivization and industrialization. Small samovar-making workshops were integrated into vast factories or disbanded. Quantity took priority over quality. However, it was during this period that the largest samovar-manufacturer of the Soviet Union, the Штамп (Shtamp) company, was founded, in Tula. The 1950s and 1960s brought significant changes, including the invention of the nickel-plated electric samovar. The hitherto undisputed reign of the charcoal-burning samovar came to an end in the face of such benefits as the ease of use and convenience, reduced tea-brewing time, and the ease of cleaning, let alone the longevity provided by the nickel-plating that protects brass from corrosion. Catering facilities and households embraced the new technology swiftly; only the railroads remained faithful to the smoky, charcoal-fueled, traditional samovar. In modern times, particularly since the Olympic games of 1980, during which visitors from around the world were introduced to and purchased samovars, the samovar gained international recognition and came to be viewed as a symbol of Russia. In contemporary times samovars are mostly associated with Russian exotica and nostalgia. They may be purchased in Europe, and in the United States they may be found in neighborhoods with heavily Slavic populations, such as New York's East Village or Coney Island in Brooklyn, or in areas with large Iranian populations like Los Angeles, California. Little Samovar of cylindrical type for home use. A samovar dispenses hot water, not tea, from its ornate spigot. A teapot (chainik) sits on top containing concentrated tea (zavarka) that is mixed with the hot water to serve tea. In this way, a large quantity of tea is available for family, friends, and even large gatherings. A properly-maintained samovar with a shining finish is a sign of hospitality and good manners of the host. Traditional samovars are operated as follows. The samovar must be cleaned thoroughly before use. It is then filled with water through its open hatch. Samovars are usually set on a large tray to keep the ashes or dripping water from causing damage to furniture. For fuel, instead of charcoal, Russians traditionally use dry pinecones. These add a hint of the resin's flavor to the tea. The traditional way to ignite the fuel is to use pieces of bark from the birch tree or small dry fir tree twigs called pautina (cobweb). Paper also works and in the Soviet era, a popular joke was that Pravda, the newspaper of the Communist Party, was particularly good for tinder. The fire needs pumping on the upper end of the tube to help it burn well. Then, the the chimney extension can be attached to boil the water, which takes approximately 20 minutes. In order to abate the fire, the cap is placed on the tube instead of the chimney. To stimulate the heater, the pump is applied. Charcoal-burning samovars are now strictly outdoor equipment. Electric samovars are used for indoor operation. Nearly all samovars have a four-legged square-shaped foundation. This keeps the samovar from damaging the furniture with its heat. Above that, is the "neck" of the samovar, or шейка, (sheika) in Russian. The neck thickens towards its top, where the ventilation chamber is located. This chamber has small intake holes along its perimeter in order to supply the combustion process with oxygen. The foundation and the neck are together referred to as поддон (poddon). Above this is the actual boiler. Inside is a thick tube (in Russian труба, truba) which constitutes the combustion chamber. The bottom of this tube is separated from the ventilation chamber with bars to prevent the fuel from falling inside. This separation is called колосник, kolosnik in Russian. Near the bottom of the boiler, a small faucet the кран (kran), protrudes from the tank. It consists of three parts: A small decoration at its stem, the репеёк (repeyok) or "thistle," that contributes to the rigidity of the mounting, the pipe itself, and simple valve with a handle, the ветка (vetka). The valve is essentially a funnel with a hole. In the two extreme positions of the handle the valve is closed, while in the central position the water can pour through the hole. The hatch of the boiler has two small handles called "cones," or шишки (shishki). There are also small steaming holes, душники (dushniki), on the hatch. Their purpose is to prevent the samovar from exploding due to pressure, and to steam the teapot at the same time. The whole construction is topped off by a crown-like teapot socket, often decorated with some ornament. 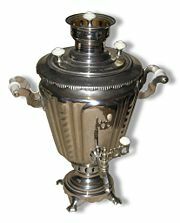 This part of the samovar is called конфорка (konforka) or камфорка (kamforka). Finally, charcoal-burning samovars come with two accessories: A cap and a chimney extension for the tube. Both need to be placed onto the open end of the heating tube, though not at the same time. The first—and most important—difference from charcoal-burning samovars is the look and the purpose of the thicker part of the neck: Instead of ventilation holes, there is a large electric socket on its perimeter; in the place of the empty ventilation chamber of the charcoal-burner, the electric samovar has a packed electric compartment. The most apparent difference, however, is the lack of the characteristic tube of the charcoal samovar. The heating coil of an electric immersion heater occupies the tube's place. The coil itself is insulated from the spiral's body (and thus the samovar itself) by a set of ceramic rings. The last important distinguishing feature of the electric samovar is the position of the steaming holes; The lack of the tube allows for a more convenient place right at the center of the kamforka. Samovar, pronounced as samāvar in Persian was originally imported from Russia. Iranian craftsmen used Persian art and Kurdish art to produce artistic samovars. Samovars have been used in Iran for at least two centuries and electrical, oil-burning, or natural gas-consuming samovars are still in use. The Iranian city of Borujerd has been the main center of making samovars and a few workshops still produce hand-made samovars. Borujerd’s samovars are often made with German silver which is a part of its famous Varsho-Sazi art. The art samovars of Borujerd may be found in Iranian and other museums as a part of a display of Iranian art. Samovars in the permanent collection of Ye Olde Curiosity Shop, Seattle, Washington. Mid-nineteenth century Russian silver samovar. Gift given to President Nixon from Leonid I. Brezhnev. An eighteenth-century samovar of Baroque shape, depicted on a 1989 USSR postage stamp. A nineteenth-century samovar, depicted on a 1989 USSR postage stamp. A classical samovar, ca 1830-1840, depicted on a 1989 USSR postage stamp. A late classical samovar, ca 1840-1850, depicted on a 1989 USSR postage stamp. Russian silver and enamel - Samovar from the late nineteenth century. Russian silver and enamel - Samovar With Cup and Tray from the late nineteenth century. Gautier, Lydia. 2006. Tea: Aromas and Flavors Around the World. San Francisco, CA: Chronicle Books. ISBN 978-0811856829. Heiss, Mary Lou, and Robert J. Heiss. 2007. The Story of Tea: A Cultural History and Drinking Guide. Berkeley, CA: Ten Speed Press. ISBN 978-1580087452. Israfil, Nabi. 1990. Samovars: The Art of the Russian Metal Workers. Fil Caravan Inc. ISBN 0962913804. Nagy, Dániel. 2002. The Samovar, Russian Tea HOWTO. Retrieved December 18, 2008. Pettigrew, Jane, and Bruce Richardson. 2008. The New Tea Companion. Perryville, KY: Benjamin Press. ISBN 978-0979343179. Price, Massoume. 2008. Making tea, Russian Samovars. Recipes and Major Ceremonial Dishes and Items, Culture of Iran. Retrieved December 18, 2008. This page was last modified on 10 June 2014, at 17:00.